• Republican Matt Barton takes the state House District 5 special election on Tuesday, winning with 55.03 percent of the 3,111 votes cast. Voters pushed Republican Matt Barton to victory in Tuesday's state House District 5 special election runoff. "It was a great night for me and my family and the state of the Georgia," Barton said Tuesday night. "I'm just humbled to have earned their support in Gordon and Murray counties." Barton beat out fellow Republican Jesse Vaughn in the runoff by 313 votes. Barton carried 55.03 percent of the 3,111 votes cast to Vaughn's 44.97 percent. Barton will fill the seat left open by the death of the late Rep. John Meadows last fall. In the Jan. 8 special election, which featured six candidates (five Republicans and one Democrat), Vaughn had finished first with 33.72 percent to Barton's 23.15 percent. With no candidate earning more than 50 percent of the vote, the top two finishers moved on to a runoff. Shortly after the 11 polling locations closed at 7 p.m., Vaughn jumped out to a lead when early voting totals were reported. However, Barton pulled closer after earning 67.06 percent of the vote from the only Murray County precinct. Then when four of the 10 Gordon County precincts completely reported results, Barton took the lead and never relinquished it as the remaining precincts came in. Barton said Tuesday night that he is unsure when exactly he will be sworn in to join the current legislative session, as voting results still need to be certified. Vaughn shared his disappointment in losing the opportunity to serve, but was proud of his campaign's efforts and did not have any regrets. "We ran the race we wanted to run ... and obviously that wasn't enough to get use over the finish line," Vaughn said. • At the CPES Complex, the second annual STEM event invites students and their families to participate in technology-related activities. The second annual STEM Night at Calhoun Elementary and Primary Complex was not only well attended, but students also brought their siblings and parents to participate in activities with them. Pictured are Lattie Carpenter, from left, Kinley Russel-Austin, Waylon Pass, Saydi Prokop and Dax Prokop. Laura Long, left, a fifth-grade teacher at Calhoun Elementary, and Addison White, a third-grade student, make paper footballs and try aiming them during Thursday's STEM night at the CPS/CES Complex. Lizeth and Marely Escobar see how tall their note card tower can get at Calhoun City Schools' STEM Night at the CPS/CES Complex, with their younger brother enthralled with their progress so far. 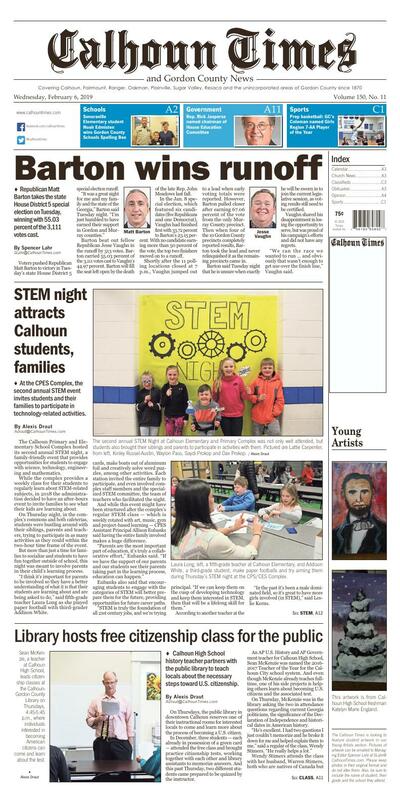 The Calhoun Primary and Elementary School Complex hosted its second annual STEM night, a family-friendly event that provides opportunities for students to engage with science, technology, engineering and mathematics. While the complex provides a weekly class for their students to regularly learn about STEM-related subjects, in 2018 the administration decided to have an after-hours event to invite families to see what their kids are learning about. On Thursday night, in the complex's commons and both cafeterias, students were bustling around with their siblings, parents and teachers, trying to participate in as many activities as they could within the two-hour time frame of the event. But more than just a time for families to socialize and students to have fun together outside of school, this night was meant to involve parents in their child's learning process. "I think it's important for parents to be involved so they have a better understanding of what it is that their students are learning about and are being asked to do," said fifth-grade teacher Laura Long as she played paper football with third-grader Addison White. cards, make boats out of aluminum foil and creatively solve word puzzles, among other activities. Each station invited the entire family to participate, and even involved complex staff members and the specialized STEM committee, the team of teachers who facilitated the night. And while this event might have been structured after the complex's regular STEM class — which is weekly rotated with art, music, gym and project-based learning — CPES Assistant Principal Allison Eubanks said having the entire family involved makes a huge difference. "Parents are the most important part of education, it's truly a collaborative effort," Eubanks said. "If we have the support of our parents and our students see their parents taking part in the learning process, education can happen." Eubanks also said that encouraging students to engage with the categories of STEM will better prepare them for the future, providing opportunities for future career paths. "STEM is truly the foundation of all 21st century jobs, and we're trying principal. "If we can keep them on the cusp of developing technology and keep them interested in STEM, then that will be a lifelong skill for them." "In the past it's been a male dominated field, so it's great to have more girls involved (in STEM)," said Leslie Kerns. Kerns and Long, who both teach fifth-grade, said they don't get much of a chance to teach STEM-related topics, as their focus points are science, history and language arts. And with state teaching standards, Kern said it's hard to find time to expand beyond the basic subjects, but she is thankful for nights like Thursday, where she can see students pursue their interests in technology and engineering. "Students and their parents need good learning experiences inside and outside of school," said fourth-grade teacher Jennifer Holley, who was wearing the blue student-designed STEM shirt on Thursday along with the rest of the STEM teacher committee. In between monitoring the different stations of the cafeterias, Holley laughed and said there are many more hands behind the scenes than just her, though she was one of the main staff members directing students and parents. She said she was encouraged to see students so engaged and excited to participate in STEM-related activities. In the next few months, the CPES Complex plans to host a science fair, and based off the successful turnout of the STEM event, Eubanks hopes to see a plethora of students showing an interest in entering in the fair. • Calhoun High School history teacher partners with the public library to teach locals about the necessary steps toward U.S. citizenship. Sean McKenzie, a teacher at Calhoun High School, leads citizenship classes at the Calhoun-Gordon County Library on Thursdays, 4:45-5:45 p.m., where individuals interested in becoming American citizens can come and learn about the test. Sean McKenzie teaches a course on citizenship provided by the Calhoun-Gordon County Public Library which is open to the public and discusses the test to become a citizen of the United States, the topics covered, and the details on how to prepare for it. On Thursday afternoons during the Calhoun library's citizenship class, Calhoun High School teacher Sean McKenzie assists those in attendance how to prepare for the test to become a U.S. citizen. On Thursdays, the public library in downtown Calhoun reserves one of their instructional rooms for interested locals to come and learn more about the process of becoming a U.S. citizen. In December, three students — each already in possession of a green card — attended the free class and brought practice citizenship tests, working together with each other and library assistants to memorize answers. And this past Thursday, two different students came prepared to be quizzed by the instructor. An AP U.S. History and AP Government teacher for Calhoun High School, Sean McKenzie was named the 2016-2017 Teacher of the Year for the Calhoun City school system. And even though McKenzie already teaches fulltime, one of his side projects is helping others learn about becoming U.S. citizens and the associated test. On Thursday, McKenzie was in the library asking the two in attendance questions regarding current Georgia politicians, the significance of the Declaration of Independence and historical dates in American history. "He's excellent. I had two questions I just couldn't memorize and he broke it down for me and helped explain them to me," said a regular of the class, Wendy Stimers. "He really helps a lot." who have lived in the United States for close to 30 years. The Stimers moved to Michigan years ago because of Warren's job, eventually finding their way down to Calhoun. And up until recently, they haven't wanted to go through the process to become citizens, as they've had history in what they refer to as an extensive process — and the couple's first attempt was back when it was much cheaper to apply. But after recently reconsidering, the Stimers want to try again. "When we first moved to Michigan, I could vote for anything except the president," Warren Stimers said. "Now some things did change, but I could still be a part of the city and everything else." "When we moved here it was a bit of a slap in the face that we couldn't vote for anything unless you're a true citizen of the state," he said. For the Stimers, who have lived in Calhoun for just over 12 years, Georgia is their home, and they're back into the process of obtaining official national citizenship. But why now? "I like Donald Trump and I know he says things he shouldn't but I feel he's done a lot for us," Wendy Stimer said. "I want to make sure I can give my vote and it's important to me. You can't complain if you don't vote, so that's my biggest thing." And Warren Stimer feels similarly, wanting to be able to participate in local government and let his voice count for something. Another student who attends the class is Janet Arroyo, a native of Mexico who has lived in Calhoun for seven years with her children. "I want to become a citizen so my kids can automatically become citizens," Arroyo said. "And to help my parents, who are still in Mexico." Though Arroyo hasn't applied to take the test yet, she wants to see what she can learn and how fast before deciding when to take it. For many of these green card holders, becoming a citizen is about more than just official status, but it signifies being able to better participate in the local community. On Thursday, McKenzie helped students prep for the test, creatively explaining the three branches of government, important geographical landmarks within the U.S. and the rights protected by the First Amendment of the Constitution. The topics of each class depend on the students in attendance and what they need to work on. The free class is hosted on Thursdays from 4:45-5:45 p.m. at the Calhoun-Gordon County Public Library, 100 N. Park Ave., and is open to the public and anyone who is interested in learning more about the citizenship process. This artwork is from Calhoun High School freshman Katelyn Marie England.